This year Kimber introduced a new line of ‘Super Carry’ 1911-style pistols. Assembled in Kimber’s Custom Shop, the Super Carry Pro (4″) and Super Carry Custom (5″) feature aluminum frames with an Ed Brown Kobra-style cut-back heel and snakeskin-style serrations. The Kimber’s slide is blackened stainless, making for a very handsome two-tone handgun. By using an aluminum frame (as found on the “classic” Sig-Sauer p226 and p228), Kimber has shaved significant weight off the Super Carrys — an important factor for guns intended to be carried all day long. The Super Carry Pro, a Commander-sized 1911 with 4″ barrel, weighs just 28 ounces (with empty mag) — that’s 7 ounces lighter than an Ed Brown Kobra Carry. Kimber’s 5″-barreled, full-size Super Carry Custom is 31 ounces with empty mag. By comparison, a full-size Smith & Wesson SW1911 weighs 41 ounces. A ten-ounce difference is significant when you’re packing. 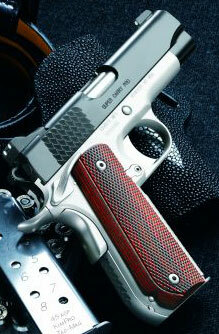 We like the new Kimber Super Carry models, though we could live without the snakeskin treatment on top of the slide. That’s over-doing it in our book. Having shot both the Super Carry and the Ed Brown Kobra I actually prefer the feel of the Kimber’s nicely radiused grip safety and I think Kimber is wise to put an ambi-safety on the gun by default (an ambidextrous safety is $75.00 extra on the Kobra Carry). In a self-defense scenario, a right-hander might have his strong-side arm disabled, so it is important that he be able to operate the gun left-handed. How about accuracy? I only had a chance to shoot a few rounds with the Kimber Super Carry Pro, and it didn’t group as tight at 10 yards as the Kobra Carry I’ve shot, but the difference wasn’t that great. Also the nearly-new Kimber’s trigger was a bit heavy and gritty, and I didn’t have a chance to work up a custom load. Neither gun shot as accurately as this Editor’s SW1911 with my handloads (VV N320 and Precision Bullets 200gr semi-wadcutters) which cost just $700.00 a few years ago. That SW1911 prints easy 1/2″ groups at 10 yards with handloads. So, is the Kimber Super Carry a good buy? Street price for the Super Carry Pro is about $1300.00, and that includes night sights. That’s over $1000.00 less than a Kobra Carry which costs $2445.00 with night sights. 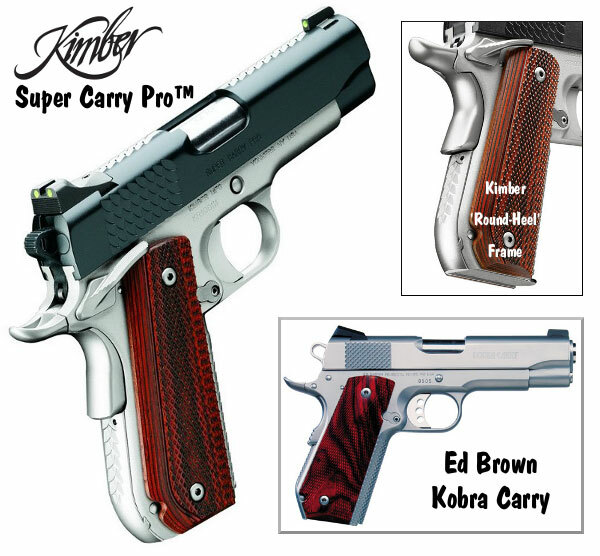 We predict those who are in the market for a Bobtail, two-tone carry gun will look very seriously at the Kimber Super Carry Pro, given the huge price savings over Ed Brown’s Kobra Carry. This Editor likes the lighter, “round-heel” aluminum frame (particularly in the 4″ model which balances well), and I like the overall feel and appearance of the gun. For $1300.00, however, I expected more from the Kimber’s trigger. As with most production 1911s it can benefit from a trigger job by a competent 1911 smith. Share the post "Kimber Super Carry Pro — Kobra Carry Clone for $1000 Less?"